French Emblems: Emblem: Obdurandum adversus urgentia. Sendurcir a ce qui resiste. Quo magis & premitur, hoc mage tollit onus. Queis mensas inter primos [=primus] habetur honos. Sendurcir a ce qui resiste. En plus hault estat se voit estre. 1. 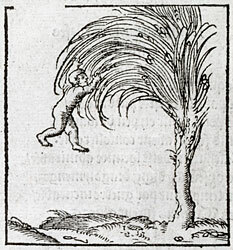 The reaction of palm to a heavy weight is mentioned in various ancient sources, e.g. Pliny, Natural History 16.81.223; Aulus Gellius, Noctes Atticae 3.6. See also Erasmus, Parabolae p.263. It probably refers to a plank of palm-wood, rather than a branch of the living tree. A similar image is used in La Perriere, Morosophie, no. 83 ([FLPb083]).